Are Generic HCP Assays Outdated? Biomanufacturers face a conflict between low-cost generic host cell protein (HCP) assays and highly sensitive but more costly process-specific HCP assays that are usually not initiated until the proof-of-concept stage. But drug developers cannot expect sufficient sensitivity from most commercially available generic assays. 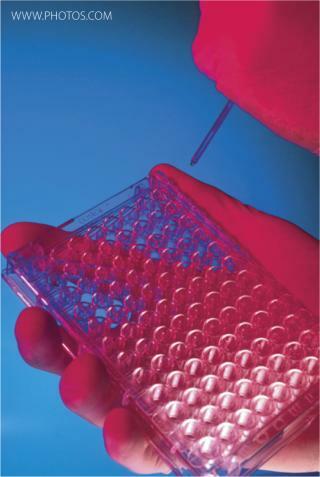 For some companies, multiproduct HCP assays could offer a solution to the dilemma. Biopharmaceutical manufacture using genetically modified microorganisms and cell lines is typically associated with contamination by process-related impurities. One of the most important contaminations during product development and production of biopharmaceuticals is HCPs originating from the production cell line. HCPs are inherent to all production processes relying on bacterial, yeast, or mammalian cell culture, and they can reduce drug efficacy and even delay or kill promising drug candidates through adverse patient reactions. Biomanufacturing therefore requires high-quality process development to reach a maximum degree of purity and demands suitable analytical methods to ensure accurate determination of residual HCPs. Such proteins in a drug substance should be “below detectable levels using a highly sensitive analytical method” (1). As a rule, they should not exceed ~100 ppm (2). Host cell protein populations are typically measured using enzyme-linked immunosorbent assays (ELISAs) with polyclonal antibodies. Such assays are widely applied during process development, for example, to demonstrate manufacturing consistency, for routine quality control, and for final product release testing. The first step in developing an HCP assay is generating and preparating an appropriate HCP-containing solution to use as an antigen for generating polyclonal antibodies. Development of a highly sensitive assay that can detect HCPs at levels ≥10–100 ppm is challenging and requires broad experience in antibody development. Proteins that are weakly or nonimmunoreactive are especially difficult to detect. The number of immunoreactive HCPs can be increased by chemically modifying an antigen or implementing special immunization protocols. A number of cascade immunization protocols showing improvements in immunoreactivity have been reported (3,4). Several rounds of animal immunizations are often necessary to secure broad antigen recognition. Nonimmunoreactive proteins can be detected by combining one- or two-dimensional sodium-dodecyl sulfate polyacrylamide gel electrophoresis (SDS-PAGE) with sensitive protein silver staining. 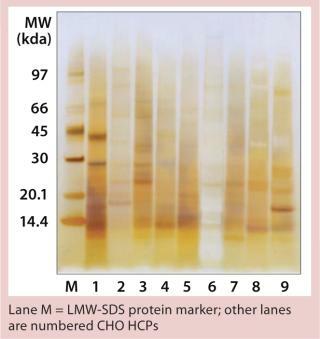 Protein is subsequently identified with mass spectrometry and/or Western blotting (5). Mass spectrometry (MS) identifies contaminating HCPs, although it is not as sensitive a method as are ELISAs. The strength of immunoassays is their detection of HCPs at levels that are undetectable using electrophoresis. An ELISA measures the collective sum of immunoreactive proteins; in other words, a signal is obtained from a number of different proteins present at low levels. So even when a recombinant product is so pure that there is not enough HCP species to be detectable with a polyacrylamide gel, an ELISA can measure residual proteins. Overall, the ELISA is more sensitive than are methods that monitor individual HCPs. In early phases of clinical product development, when the risk of drug failure is still high, sponsors often use generic HCP assays to minimize costs. When a drug has passed the proof-of-concept hurdle, then process-specific HCP assays displaying full specificity can be developed. 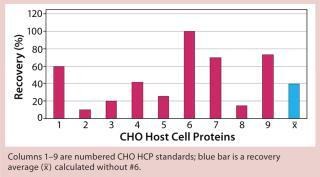 Commercially available “generic” HCP assays are supposed to measure all host cell proteins that could be present in a given cell line — e.g., Chinese hamster ovary (CHO) cells — independent of the downstream processes used. Such assays are based on polyclonal antibodies developed against a representative HCP preparation, so they broadly react with as many HCPs as possible. Process-specific assays use polyclonal antibodies produced against HCPs sampled from a given mock fermentation and a conditioning or purification step. Such assays are usually highly specific for their corresponding HCP mix, so they are generally expected not to react as broadly as generic assays for an accurate determination of HCPs from different production processes. Although generic HCP assays are intended to detect nearly all possible HCP contaminations independent of an individual production process, several sponsors have found insufficient sensitivity with such assays and a lack of immunoreactivity with certain HCPs. To investigate this issue, we compared several process-specific HCP ELISAs with a commercially available generic HCP ELISA regarding their ability for quantitative HCP determination in CHO-derived antigen preparations. 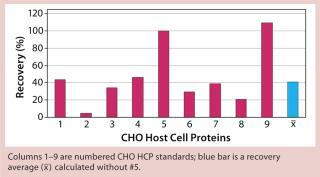 To evaluate the sensitivity of several CHO HCP assays, we performed a comparison study on five process-specific CHO HCP ELISAs (referred to here as #1, #2, #3, #4, and #5) and one commercial generic CHO HCP ELISA (#6). The process-specific ELISAs were developed and adjusted exclusively for one production process and are intended to recognize all process-specific HCPs, which represent cell line characteristics as well as individual process parameters such as fermentation strategy and product isolation. We used a process-specific HCP mix as the antigen for antibody generation (by immunization and affinity purification) so the antibodies in turn represent the composition of that respective HCP pattern. The generic assay is a CHO HCP 3G ELISA kit (catalogue #F 550 from Cygnus Technologies, www. cygnustechnologies.com) developed using CHO HCPs derived from conditioned cell culture media as the antigen for immunization and affinity purification. We analyzed eight different specific CHO HCP standards and one generic mix with five process specific CHO HCP ELISAs developed at our company and the commercial generic ELISA using internal BioGenes instruction protocols and the supplier’s instruction protocol, respectively. The preparations were diluted depending on their HCP concentrations (total protein concentration) to 100, 50, 25, and 12.5 ng/mL and then determined in the different CHO HCP assays. We calculated the HCP concentration in each assay using its corresponding ELISA standard curve and evaluated recovery by calculating the HCP percentage found in each ELISA based on those specified HCP concentrations. To visually compare the CHO HCPs, we used SDS-PAGE with SilverXpress silver staining from Invitrogen (www.invitrogen.com) with NuPAGE 4–12% Bis-Tris Gel, SDS sample buffer, and MES-SDS running buffer (nonreducing conditions), all also from Invitrogen. An LMW-SDS marker from GE Healthcare (www.gelifesciences. com) served as our molecular weight marker. Figure 1 shows the results of applying the generic ELISA for determination of CHO HCPs. Figures 234 show results results achieved using process-specific ELISAs. Plots in Figures 1234 are based on an assumption that assays #3, #4, #5, and #6 detect 100% of their respective CHO HCP standards. The mean recovery of HCPs obtained from different production processes using the generic ELISA (#6) was only 40% (Figure 1). Only three of the eight standards showed crossreactivity > 50%. So for most CHO HCPs, the generic ELISA did not fulfill the criteria required for an accurate HCP determination. This contradicts the supplier’s specification that nearly all CHO HCPs could be detected independent of downstream processing methods used. When applying process-specific ELISAs for determination of different CHO HCPs, we see an ambivalent picture. Two process-specific assays (#3 and #4) showed higher mean recovery rates of ~55% (Figures 2 and 3), whereas others showed only mean recoveries of 33% (#1) and 3% (#2) (data not shown). Mean crossreactivity of process-specific assay #5 was comparable with the generic assay #6 (Figures 1 and 4). The lower mean recovery rates of some process-specific HCP assays compared with the generic assay is as expected because process-specific HCP assays can accurately detect HCPs only from specific manufacturing processes. However, we were surprised to find that process-specific assays #3 and #4 were comparable with or even better than the generic HCP assay. Antibodies from process-specific assays are usually not as broadly reactive as those from generic assays. The generic assay’s limitation also becomes obvious when we applied it to HCP preparations 3, 4, and 5. 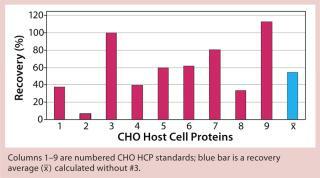 Only 20% of CHO HCP standard #3 could be detected. 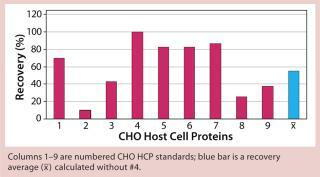 With the other HCP standards, 40% (#4) and 25% (#5) of the proteins were detected (Figure 1). For a generic assay intended to recognize a broad HCP population, we would have expected recover y rates ≥70%. We qualitatively demonstrated the heterogeneity of process-specific CHO HCP preparations with SDS-PAGE using silver staining (Figure 5). Main HCPs could be detected within a molecular weight range of >100 down to ~10 kDa. Characteristic HCP bands for the different CHO HCPs are clearly visible. HCP populations differing widely among products would suggest that process-specific ELISAs are not as efficient as the generic assay; however, that was not the case for process-specific ELISAs #3 and #4. The fact that process-specific parameters strongly influence the HCP profile could be confirmed by the clear differences in recovery of HCPs in ELISAs 3, 4, 5, and 6 (Figures 1234). Our results show that the generic HCP assay we tested didn’t perform as specified. Among five process-specific HCP assays we tested, one assay showed comparable and two showed even better performance than the generic assay, although the assays were developed for a specific process. The higher sensitivity of some process-specific HCP assays was unexpected. But it seems that sponsors cannot always expect sufficient sensitivity from commercially available generic HCP assays. Because development of highly sensitive process-specific HCP assays is associated with higher costs, such assays are usually not initiated until proof-of-concept. In phase 1 and phase 2 clinical trials, when generic assays are generally used alongside the manufacturing process, patients thus may be exposed to HCP-related risks. Developing “multiproduct” HCP assays could provide a compromise between generic and process-specific assays. These HCP assays are suitable for sponsors that use proprietary production cell lines for multiple products. The assays are generated against cell-line–specific HCP populations that are prepared from optimized cultivation and fermentation processes. Once developed, a multiproduct HCP assay can be applied like a generic assay except that it is far more sensitive and specific. Multiproduct HCP assays ensure accurate HCP determination during process development, routine quality control, and final release testing. They can be optimized to become process-specific, if necessary. Because these assays can be used for all products derived from a particular cell type or expression system, their development is a worthwhile investment. Corresponding author Dagmar Schwertner is marketing director at BioGenes GmbH, Köpenicker Straße 325, 12555 Berlin, Germany; 49-30-65762380; d.schwertner@biogenes.de. Michael Kirchner is head of assay development at BioGenes GmbH. 1.) CBER 1997.Points to Consider in the Manufacture and Testing of Monoclonal Antibody Products for Human Use, US Food and Drug Administration, Rockville. 2.) Eaton, LC 1995. Host Cell Contaminant Protein Assay Development for Recombinant Biopharmaceuticals. J. Chromatogr. A 705:105-114. 3.) Anicetti, V. 1989. Immunization Procedures for E. coli Proteins. Appl. Biochem. Biotechnol. 22:151-168. 4.) Thalmer, J, and J. Freund. 1984. Use of a Cascade Immunization Protocol to Elicit Antibodies to Multiple Antigen Mixtures. J. Immunol. Meth. 100:245. 5.) Anicetti, VR. 1989. Immunization Procedures for E. coli Proteins. Appl. Biochem. Biotechnol. 22:151-168.